A while back I gott a nonfunctioning Sonic 3, board only. Although it was reasonably clean, i didn't boot. It showed a message telling it was designed to be played on NTSC systems. So, I played a little with the switches and it booted fine with all of them off. Interestingly it didn't boot alone even with a game genie. I quickly opened it to see what's inside and I only could find an epoxy blob, the 4 switchs and some parts marked as RPx, wich I suppose are some resistors associated on a bar. I also removed the FRAM and the logic circuits around it, routed the ROM /CE to the 74HC139 pin 1 and got the same results. Is there anything I can try to do to make it boot alone? It's also missing all the capacitors, except the electrolytic one. What capacitors are these? I think they're decoupling capacitors, but I didn't find an clear enough image to see its values, would they be 100nF (104) ones? 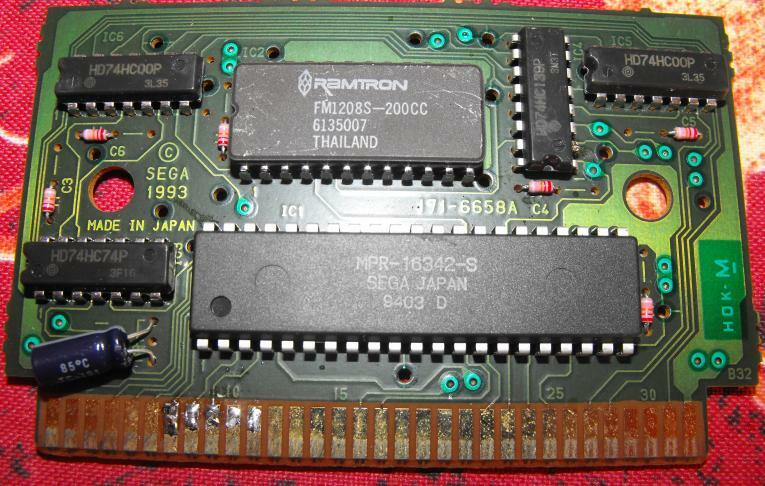 Also, it's not saving, I fount that specific FRAM chip (FM1208S) to be expensive, maybe I could use an SRAM on its place. Better resolution here and here. Oh, and I noticed I forgot to take a picture of the assembled board. If someone could please RE this board for me, I would be very happy. Last edited by Fisher on Tue Mar 06, 2018 5:59 am, edited 1 time in total. I traced it out about a year ago. It's not that complex. Most of the functionality of the logic revolves around changing between sonic 3 mode as an individual cart, and sonic & knuckles + sonic 3. That gets controlled by B27 #RESET. the S&K grounds that pin permanently for the S3 cart. Could be some errors with my schematic. I only beeped out the interesting parts with a DMM. 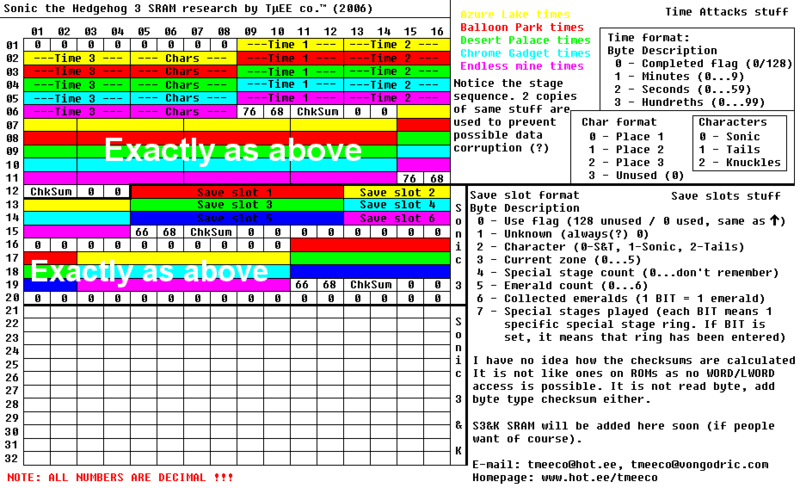 File comment: Sonic 3 schematic beeped out. This reminds me of my own problems with my Sonic 3 cartridge I've had since 1994. It never saved games, but I didn't consider this a major issue as a kid. Only recently I got curious about it again and decided to check what could be the problem, and to my surprise, the FRAM appeared to have been intentionally disabled, as one of the traces leading to it was cut. I have no idea why anyone would do that, specially considering this was an original TecToy cartridge, bought sealed from a respectable store. I haven't tried to restore that trace yet, but I guess it would be cool if my cartridge was finally able to save. I traced it out about a year ago. An interesting thing I noticed is that my game (besides the 74HC139 and the 74HC74) uses 2x 74HC00, while yours use an 74HC157 and a 74HC00. I finished my 1st RE try a whyle ago. I also lokked at the FeRAM circuit only. I don't think a SRAM mod would be much difficult, but I have no idea where I could put a socket for a battery and be able to close the cartridge normally. I also found something about the MegaKey here. Altough it's a MegaKey 2, I don't understand properly the schematics and didn't found the IC's datasheet around. Looks like there's lots of NANDs and 2 latches on the final draw. Maybe I have a problem with the MaskROM. That could explain why the thing only boots with the adapter. I think this one is a TecToy too. The difference is that I got this as garbage. I also have high hopes to get it working properly!! 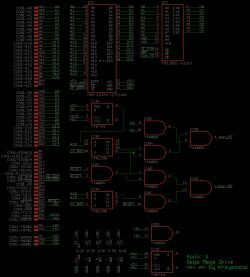 That schematic looks like a lot of "generate a bus conflict and win!1!one"
It consists of two input elements DD1.1 ("AND-NOT", address 508000H) and DD1.2 ("And", address 600002H). But I don't understand why the game boots with the adapter and not without it. I'll take a look at what they're doing. I hadn't actually looked at Рис.2 ... but looking closely now it appears to be describing the reverse-engineering process. Рис.4 and Рис.5 are an all-new-parts implementation of the same schematic, using Soviet part numbers. I only need a little more time to "digest" it. I think the description "game don't boots" is a little vague, so I did some tests to try to find what is happening. - No TMSS MegaDrive = black screen. - TMSS MegaDrive = "Produced by..." screen, than black screen. - Gamegenie = same results with the exception I got the Gamegenie's screens before. - Sonic & Knuckles = boots with a corrupted screen and keeps resetting, just like this crappy video shows. With the Megakey, all the above tests worked fine. The game only resets after the 3rd reset press. The MegaKey I have is a bit different. It only has an epoxy blob, 4 switchs and 3 parts marked as RP1 to RP3. All the 4 switches have one pin plugged to GND, the other pin goes for the blob. I called A, B, C and D the indivitual pins of the epoxy blob the switchs connects to. Would these resistor bars be responsible for the game working with the adapter? Maybe it's a problem with the MaskROM, but to confirm this I would need to dump it. I have found some options, including one that uses a SegaCD to dump the game. But unfortunatelly I don't own a SegaCD, and I need to take a better look before trying to build any of the other options. If someone can please do a similar program that can do that without a SegaCD, I'll be very thankfull. This one particullary seems to be a good option to me. Use diode test and measure each IO against VCC and GND, they should all show very similar results. If one differs from the rest then that pin may be fucked. I revived a SoR2 cart by placing a pullup resistor on a pin that didn't match the others. Sonic 3 will boot without any of its companion hardware present provided you wire !CE and !OE pins to the ROM properly. If this most bare config doesn't work then it narrows the problem down to PCB and ROM. If all traces reach the ROM from cart edge you have a bad ROM at your hand. The PCB uses crappy glue vias that may fail in some way. I had already wired the !CE pin straight from the cart edge to the ROM and got the same results. I'll do the diode test on all ROM pins as soon as I get home. What is very weird is that it works fine with the MegaKey, would it be it's pullups/pulldowns that are doing the "miracle"? I'm seriously thinking in replicating it on the PCB. Thank you so much TmEE! I tried the diode test with the - probe on vcc and got about 20 different readings. But with the inverse (+ probe on gnd), I got only one different reading. I soldered a 1K pull down and bang! It worked alone! I forgot to ask about the save RAM, does the game really use 1kb to save? If so, I can plug it's A8 pin to vcv and it should work. But maybe I should install a 16Kb SRAM with a simple battery circuit. I wouldn't bother at all with SRAM, the FeRAM is better though it has limited writes durability but you do get unused part of the chip only top address line change away. EDIT: fixed stuff. I looked at my old research and there's 320 bytes of save data actually used in Sonic3 alone, rest in S3&K. Last edited by TmEE on Mon Feb 26, 2018 12:24 pm, edited 2 times in total. This ram is 100% pinout compatible with 6116. 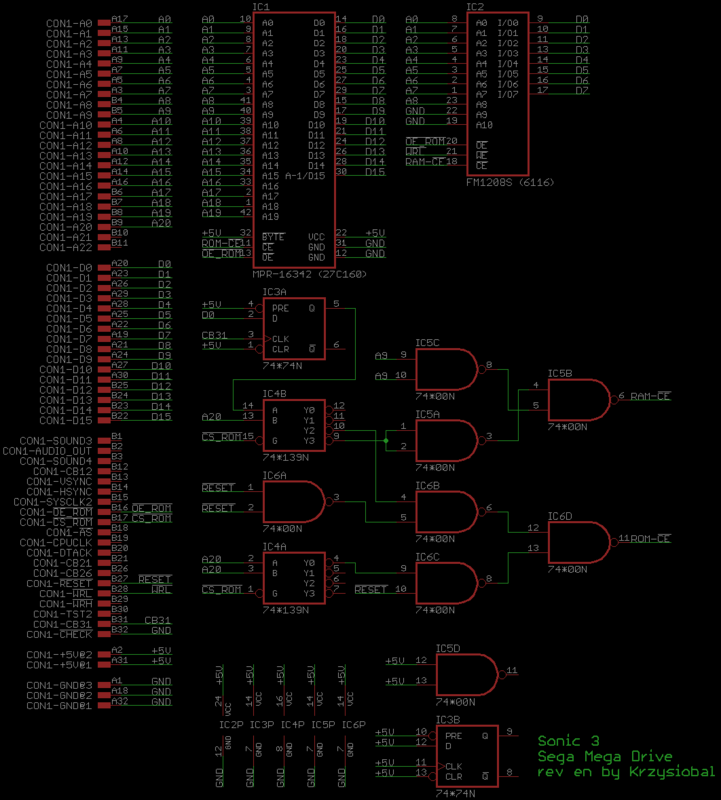 As you can see from schematics, A9/A10 (which is NC in this chip) is tied to GND so this game uses 512 bytes of RAM.